Interestingly, many folks may not realize that the Corn Earworm is the same pest called Cotton Bollworm when it infests Cotton plants. "The popular new strategy of planting genetically engineered crops that make two or more toxins to fend off insect pests rests on assumptions that don't always apply, UA researchers have discovered. Their study helps explain why one major pest is evolving resistance much faster than predicted and offers ideas for more sustainable pest control." The above article and it's link along with the abstract is enough to give you an idea of the change of stand that many scientists are now saying that genetically engineered plants (in this case Corn) with inserted multi-toxin properties to kill insects that eat them are most likely not a good idea after all. It's clear and this has been known for a long time now that the DNA within insects and/or plants (those labeled as weeds), will eventually re-engineer themselves to resist the deadly qualities of the toxin manufacturing genes introduced into the crop plants. This really isn't any surprise. In the beginning almost the entire Biotechnology industry was built on this two gene trait and this is what the article here is focusing on, but things have come along way since the 1990s. Funny though, that this article above would only focus strictly on the 2 toxin gene GMO Corn and say nothing of the mega-gene experiment of agricultural-biotechnology giant Monsanto introduced back in 2010 it's latest mutant called Genuity SmartStax RIB Complete Corn , which in reality was far more toxic than those that came before it. 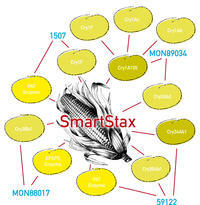 Interestingly, this corn actually "stacks" eight genetically engineered traits, six of which manufacture lethal toxins which allow it to attack the insects to a greater degree than previously and two traits which allow the drenching of Monsanto's trademarked weed killing chemicals like glyphosate otherwise known as "Roundup". It was actually the first time in 2010 that a GMO farm crop seed was marketed which had more than 3 traits. Funny that the above article expressing concern over insect resistance didn't really mention any of this. I suppose this study caught my eye because I actually do have a food allergy to most of the larger well known brand named cornflakes. "Genetically engineered plants inherit technically derived features that are not controlled by the plant's gene regulation. Technical failures such as genetic instabilities and/or occurrence of undesirable components can be triggered by specific environmental conditions." Of all the paragraphs in this SmartStax technical report by TestBiotech, I think it speaks for all forms of living organisms and the sophisticated genetic communication systems which allows any living thing to live and thrive. Information within each kind of living thing is specific to it's needs and functions. Clearly as acknowledged, there are genes for the manufacturing of specific proteins, in this case toxic ones. In the case of GMO crops, a specific gene (call it a program or file or whatever you want) is identified from one organism and guess what ? , it's toxic. But it has a trait for which to the GMO Researcher would find to be desirable in another organism like a profit producing farm crop plant for warding off insect pests. The problem is as the paragraph in the report expresses, there are OTHER programs or files within that system which regulate, guide and direct just how those proteins are used, where, how and when. This information is left behind in the first organism, so that the recipe for the making of the toxin is now unregulated and inserted within the communications system of it's newer host. That presents problems of what has been called unforeseeable or unintended consequences. The current GMO technology is actually shackled to obsolete information and mere theory for which the second sentence in the above quote was referring to bad side effects. Part of the problem with this bad science is that it has been influenced by ideological propaganda and philosophy by an Elite Group of self-proclaimed scientific religious orthodoxy which insists it speaks for ALL science. Hence, scientific understanding of DNA has been hindered by the dogma of Junk DNA. If it doesn't code for a protein it must be useless Junk. Yet even now better science is discovering that what used to be hailed as Junk DNA does have function after all in the form of guidance and regulation of what a specific protein will do and accomplish once manufactured. In other words laws or rules for how, what and where such proteins as in this case a toxin is manufactured and for what purpose. In GMO technology, these important instructions are left behind and there is no guarantee that once inside the new organism that the gene finds itself in will even function properly. So quite literally, the ONLY Junk DNA are the ones Scientist's are creating in the Lab. Let me illustrate. Take this animation of the old Tomato Potato Plant idea. I'm condensing it because I have a point on both vegetable products and the plant infrastructure which supports them. For years I've seen these illustrations in plant magazines, but I have no idea about how reliable such plants from a catalog could be. But my point is that both are from the Nightshade family. 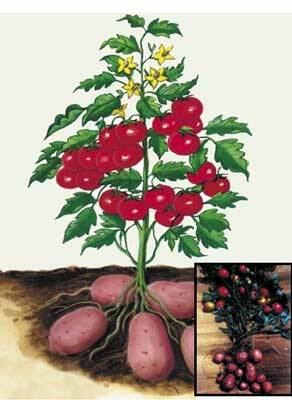 Both potato tubers and fruit of tomato are edible as we all know. Yet on both plants the foliage is toxic to us. Now why is the foliage toxic but not the fruit or tuber ? Clearly within these organism is a gene program for the manufacture of toxic elements, but there are also specific instructions for how they are used and applied. Those guidance and procedural regulations are not present in the GMO plant. One of the justifications for the GMO built in toxins is that these have been sprayed onto plants as an insecticide for years anyway. True, but these are temporary and can wash off or degrade radily in the environment surrounding it. Now in the new GMO plant cell, every single cell WITHIN that organism manufactures these unregulated toxins. So the food item that we eat is loaded with toxins which targets and kills insects, also will eventually feed animals and people who may or may not have adverse reactions to these toxins. But for the sake of argument, let's say some of them were. So how do they know exactly where to place that gene in the correct accurate sequence along the DNA strand of the new host ? They don't. They don't know enough about the genetic language to be able to read it accurately, let alone know what the informational patterns within DNA are expressing. The whole insertion of the gene into the new cell is primitive and absurd at best. Utilizing a bacteria or virus by depleting them of their own qualities and inserting this gene into the shell of these living things, these are then used to infect the plant cell, and there is clearly no way to know exactly where it is going end up or what it will do once there. Even their much Propagandize Gene Shooting gun wonder where they randomly shoot these genes into a group of cells, hoping a few genes take hold, there is no sophisticated way to understand what type of programming will result. GMO technology is still a very sloppy and crude technology, but it's the potential for massive profits which pushes things to the limits without any discipline. With Corporate Board Members and investment hungry share holders breathing down their necks, there is no time for the researcher to do all the necessary responsible testing for years before release. The product was needed yesterday, not decades from now. In my secular work, I am contracted by pharmaceutical companies for compiling data research I collect from doctors which I interview on any number of specific medical problems, conditions or issues a person may have with their health and the effectiveness or not of result of a specific drug or combination of drugs for that situation. Some Doctors are pretty sharp and up to scratch on the science of drugs and any reactions, and interviews with them are usually longer and more info than the client really wanted anyway. The vast majority of the Docs view their profession as a business and switch drugs at will for no other reason than a gut felt feeling that perhaps this drug will improve things. I'll tell you one thing, such interviews make you realize who you would and would not want working on you in a life threatening situation. But if I have the time, I actually ask after the interview if they are seeing any adverse effects with regards GMO foods. Not so much yet that they can identify, but they all are in agreement that there are huge numbers of people over the past decade which have acquired food allergies and it's growing, specifically to such things such as grains. Take the common American Brand Cereals like Kellogg's Corn Flakes. Most all American brand cereals and even Industrial cheap generic brands are sold here in Sweden. I have an allergic reaction if I eat any of these and even some breads. I get a burning sensation in my esophagus, stomach indigestion and red hives under my throat and jaw. It lasts for an hour then goes away. Now IF I pay the higher price of legit eco-brand cereals and other Muesli products, I get no such reaction. I thought I had just become allergic to all and any grains. Apparently not. So what is the difference ? I don't think I even have to answer that. The propaganda from the GMO Industry is that there are no such dangers from these toxins to humans. Yet, I remember back in the 1990s when that GMO corn field trial contaminated other farms and lawsuits were filed. It was admitted back then that the GMO corn being raised was for livestock consumption and not humans because it caused allergies. Now suddenly this is denied. Of course many of the independent Labs are showing otherwise. Many dangerous products were at one time backed by science as safe, even healthy. Take Cigarette ads like the one to the left. The thinking was common and backed by Cigarette paid and bought scientists that everything was okay. There's an interesting way to compare Cigarette smoking with food intake of GMOs. When a person starts to smoke cigarettes when young, do they immediately develop cancer, emphysema or heart disease ? Of course not. At worst during the first decade or so, they may cough, have shortness of breath and other mild side effects, but later on continued smoking of toxins build up in organs of the body and other more serious health issues come to the fore. GMOs are no different. The doctors whom I interview all agree that they will be dealing with mild side effects and later more serious problems like some type of organ damage or cancerous tumors on down the road. 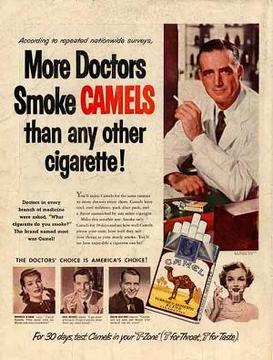 Of course Cigarettes were always a lifestyle choice, but this is NOT the case with GMO Foods. For the most part GMOs are the ONLY food item of choice on the shelves in many locations and I can now understand why some commercial ventures like Grocery Store chains were against labeling. Lawsuits could result later on if GMO contamination were found present in items sold under the Non-GMO label. You see, there is NO WAY to guarantee their Junk won't end up in another field listed as GMO free. Some of the Doctors joked about the increasing of business for themselves if the data was true. No surprise there. The scary thing to me is that this damage that has already been done by the GMO Industry is irreversible. Seriously, how do you make error corrections in genetically polluted organisms ? You don't. When a forested ecosystem collapses as a result of inferior trees and shrubs as a result of genetic pollution introduced into the Industrial forested system into the wild, how to you provide error correction there ? You don't. It's bad enough that humans have almost completely obliterated most ecosystems around the globe in the sense of the pristine way they functioned previously, but replacing them with with not only substandard organisms, but clearly things that will hasten further downfall. It's clear that in the Political and Corporate world, there is no twinge of conscience for the consequences of the irresponsible actions they have and will take and presently protecting with laws. I think the laws are there to set up protection against any lawsuits which will demand compensation for health damages which no doubt will come. The game will be as to how to spin the damage as another cause. NONE of the Corporate entities have ever given strict replication of nature a chance. There is simply no money value to be attached to such applications or practices and where no monetary value is found neither will interest be present. I'm becoming at a loss of what to tell people to do anymore. There is no materialistic fix for this. People will have to garden or form cooperatives privately and independently, but even that is no guarantee that genetic contamination will not ever result. Do some homework. For example, GOOGLE GMOs and you will find that just about every kind of farm crop plant, tree or shrub you can think of and you will find some company researching to create and patent an organism which will bring nothing but profit to the patent holder. As if peanuts weren't allergic enough to some, they are attempting GMO peanuts. I haven't even touched on animals and other lifeforms. The number one motivation has never been about "We Just Want to Feed the World", this is an untrue statement. It's always been a business decision. The best you can do is to keep yourself educated and re-evaluate what and who you are putting your trust & faith into. NPR: "Insects Find Crack In Biotech Corn's Armor"
What is Biosemiotics? "The study of signs, of communication, and of information in living organisms" (Oxford Dictionary of Biochemistry and Molecular Biology, 1997. Oxford: Oxford University Press, p. 72). "Biosemiosis is living processes understood as sign processes, as studied by bisemiotics, the science of biology in the perspective of signs, information and meaning. This blog explores yet unknown dimensions of biosemiosis, and provides practical info supplementing the international website."